To record a sonar log from which GoFREE’s cloud-based software creates a highly detailed Insight Genesis custom fishing map, you need only a compatible Lowrance unit (HDS Gen2, Gen3, Elite) and an blank SD card. Most any type SD card will work – no prohibitively expensive special card is required. Recording a sonar log – which requires a mere three keystrokes – happens in the background on your sonar unit, requires no additional hardware or accessories, and won’t slow down your Lowrance unit or affect its performance in any noticeable way. 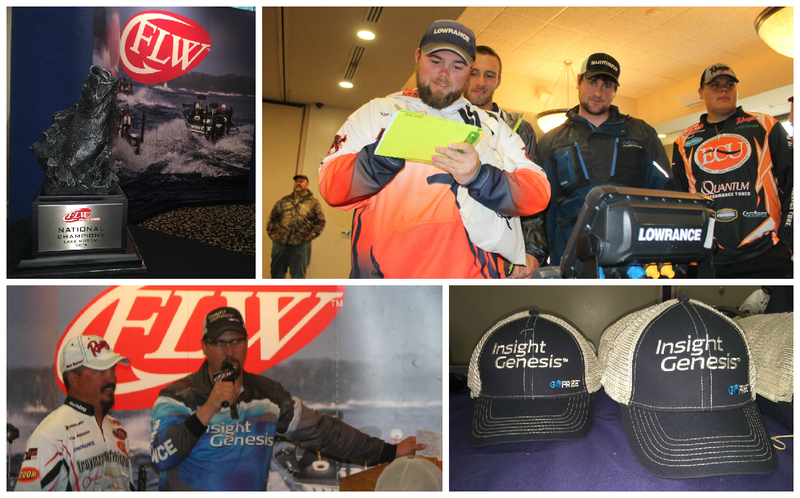 Of the 50 college teams that launched on South Carolina’s Lake Murray this morning in the 2015 FLW College Fishing National Championship presented by the Lowrance Insight Genesis College Cup, each is eligible to claim the Map & Win! 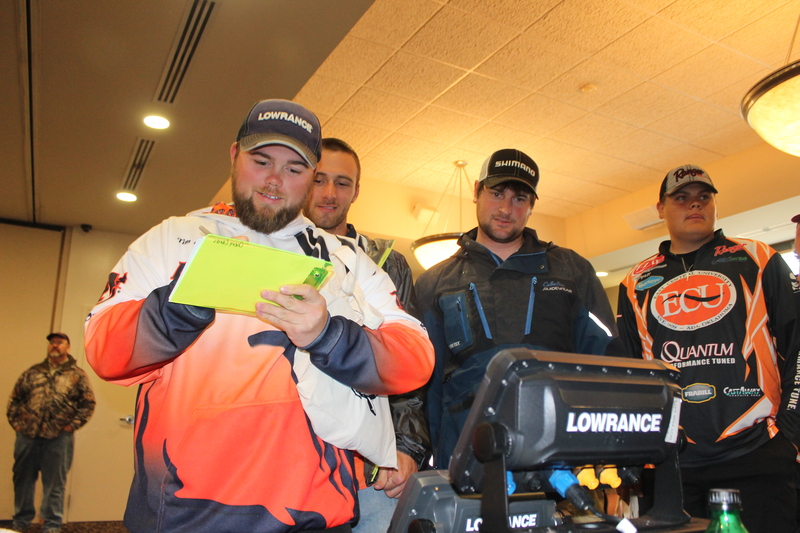 contingency prize, provided they mapped at least 100 acres sonar data on the lake during the tournament’s official two-day practice period or in the 30 days before it went off-limits. Both College Cup and the new Map & Win! program are free to enter for all FLW and B.A.S.S. college anglers. The team that wins the FLW College National Championship on Saturday will also win a Ranger Z117 bass boat and a berth in the 2015 Forrest Wood Cup, the FLW Tour’s world championship. The Cup, to be held August 20-23 on Lake Ouachita in Hot Springs, Arkansas, will offer the collegiate anglers the opportunity to compete for a top award of $500,000. All prize money earned in The Cup goes directly to the angler who earns it. 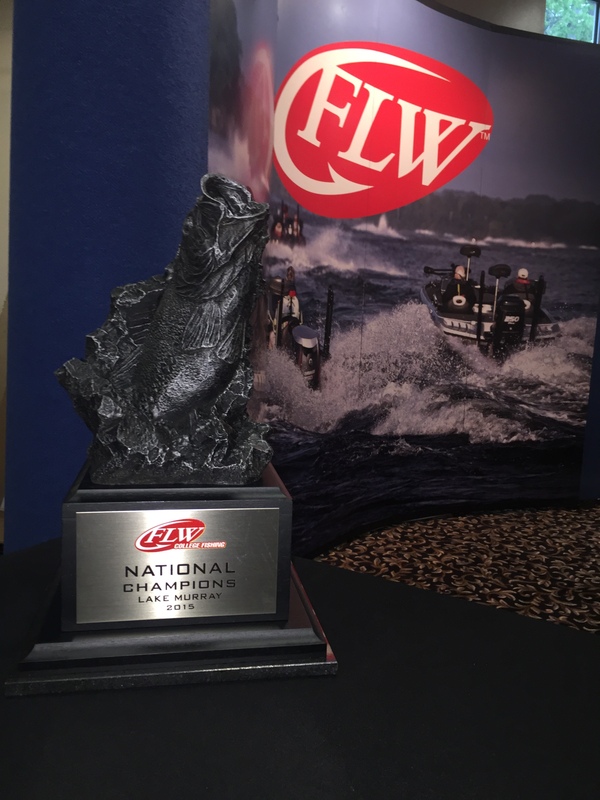 Competitors in the FLW College Fishing National Championship will take off today, Thursday, Friday and Saturday at 7 a.m. from SCE&G North Recreation Area at Dreher Shoals Dam, located at 2101 N. Lake Drive, in Columbia. Weigh-ins will be held adjacent to Carolina Stadium at Williams and Wheat Streets in Columbia beginning at 5 p.m. Thursday and Friday and at 4 p.m. on Saturday (or immediately following the end of the University of South Carolina baseball game). Takeoffs and weigh-ins are free and open to the public. Arkansas Tech University – Sawyer Grace, Russellville, Ark., and Brandon Rieve, Sheridan, Ark. Auburn University – Ben Curry, Hayden, Ala., and Timmy Ward, Sylacauga, Ala.
Auburn University – Candler McCollum, Auburn, Ala., and Wiliam Bates, Suwanee, Ga.
California State University-Chico – Andrew Loberg, Rocklin, Calif., and Michael Braswell, Chico, Calif.
Christopher Newport University – Peter Kenny, Ashburn, Va., and Cody Griffey, Smithfield, Va.
Colorado Mesa University – Kennedy Kinkade and Josh Worth, both of Grand Junction, Colo.
East Central University – Tanner Masters and Wyatt Ryan, both of Ada, Okla.
Eastern Kentucky University – Kyle Raymer, Brandenburg, Ky., and Ethan Snyder, Vine Grove, Ky.
Eastern Washington University – Cy Floyd, Wenatchee, Wash., and Tyler Wasilewski, Cheney, Wash.
Eastern Washington University – Nick Barr, San Antonio, Texas, and Jarred Walker, Cheney, Wash.
Humboldt State University – Christopher Childers, McKinleyville, Calif., and Erich Coulter, Arcata, Calif.
Jacksonville State University – Nate Killough, Sylacauga, Ala., and Will Bullen Jacksonville, Ala.
Kansas State University – Nathen Kozlowski, Junction City, Kan., and Lance Maldonado, Chapman, Kan.
Louisiana Tech University – Caleb Boudreaux, Doyline, La., and Matthew Loetscher, Many, La. Mansfield University – Matt Novitski, Kingston, Pa., and Alec Engleman, Milton, Pa.
McKendree University – Dustin Pendegraft, Summerfield, Ill., and Phillip Germagliotti, Highland, Ill.
Murray State University – Justin Graben, Murray, Ky., and Dan Schult, Millstadt, Ill.
Murray State University – Seth Brock, Cedar Hill, Tenn., and Lance Freeman, Eddyville, Ky.
Nicholls State University – Trevor Leblanc and Jess Robertson both of Houma, La. Oregon State University – Chase Cochran, Corvallis, Ore., and Ryan Sparks, Gearhart, Ore.
Oregon State University – Peter Kawamura and Eric Strickler both of Corvallis, Ore.
Polk State College – Wesley Wise, Lake Wales, Fla., and Luke Ferguson, Bartow, Fla.
Radford University – Will Bowling, Fincastle, Va., and Justin Witten, Radford, Va.
Ramapo College – Joseph Zapf and Andrew Zapf, both of Whippany, N.J.
Rutgers University – New Brunswick/Piscataway – Kyle Genova, Millstone Twp. N.J., and Andrew Ridinger, Thorofare, N.J.
San Jose State University – Adam McAndrews, Santa Clara, Calif., and Joey Fortina, Ben Lomond, Calif.
Shenandoah University – Thomas Arens, and Billy Arens, both of Winchester, Va.
Shippensburg University – Kevin Hollasch, Marriottsville, Md., and Hunter Chamberlin, Shippensburg, Pa.
Sonoma State University – Brent Nelson, Santa Rosa, Calif., and Jake Banuelos, San Pablo, Calif.
Southeastern Oklahoma University – Jonathan Furlong, Bixby, Okla., and Dwight Camp, Talihina Okla.
Tennessee Technological University – Joe Ellis, Harriman, Tenn., and Matthew Townson, Chattanooga, Tenn.
Tennessee Technological University – Matt Allen, Bloomington Springs, Tenn., and Zach Youngblood,, Silver Point, Tenn.
University of Alabama – Keith Kirkley, Northport, Ala., and Frankie Appaluccio, Tuscaloosa, Ala.
University of Florida – Shelby Concon, Fruitland Park, Fla., and Kyle Smith, MacClenny, Fla.
University of Louisiana-Monroe – Blake Alford and Tyler Stewart, both West Monroe, La. University of Missouri – Ben Verhoef, Osage Beach, Mo., and Christian Ponzetti, Excelsior, Minn.
University of Oregon – Kyle Schneider, Beaverton, Ore., and Jacob Wall, Jacksonville, Ore.
University of South Carolina – Patrick Walters, Summerville, S.C., and Gettys Brannon, Columbia, S.C.
University of Wisconsin-La Crosse – Pat Bowers, Hudson, Wis., and Sig Finley, Wonder Lake, Ill.
University of Wisconsin-Platteville – Brett Daggett, Cottage Grove, Wis., and Ryan Gilbert, Sterling, Ill.
West Virginia University – Mathew Gibson, Morgantown, W.Va., and Edward Rude III, Falling Waters, W.Va.
Western Carolina University – Austin Neary, Cullowhee, N.C., and Zack Hicks, Cherokee, N.C.
Western Kentucky University – Ryan Coleman, Utica, Ky., and Stephen Compton, Bradengburg, Ky.
Winona State University – Wyatt Stout, Winona, Minn., and Cade Laufenberg, Stoddard, Wis.
FLW will host its College Fishing Expo from 4:30 to 7:30 p.m. on Thursday and Friday and from 11 a.m. to 1 p.m. on Saturday. The Expo will take place adjacent to Carolina Stadium. Activities will include a sports zone, tailgate games, sponsor giveaways and a Ranger boat simulator. 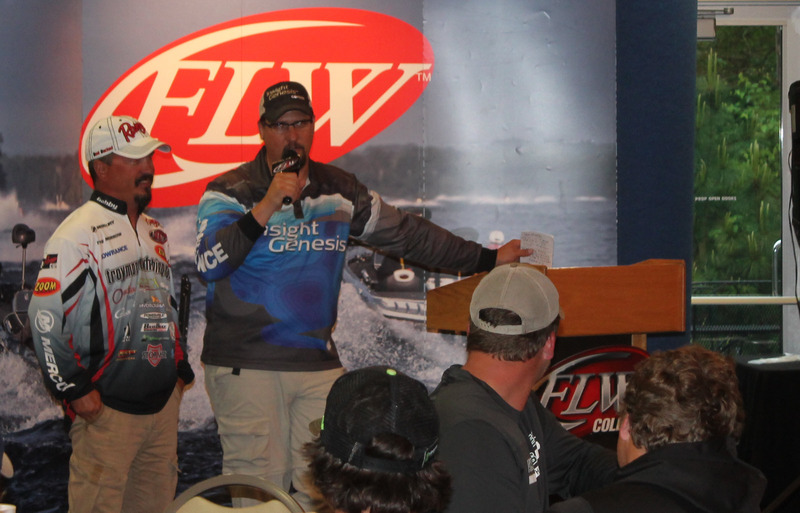 Coverage of the 2015 FLW College Fishing National Championship will be broadcast in high-definition (HD) on NBC Sports Network on Nov. 16 from 7 to 8 p.m. EST. The Emmy-nominated FLW television show airs on NBCSN, the Pursuit Channel and the World Fishing Network. It’s broadcast to more than 564 million households worldwide, making it the most widely distributed weekly outdoors-sports television show in the world.